A user can access our web site and utilize a number of our services without providing any information at all. However, all users who register for our opt in services are requested to provide basic contact and demographic information. Donegal Self Catering Association will not disclose a user's personally identifiable information to any third party without the user's express permission. We do not follow a user's browsing path outside of our seb site. The information collected when a user signs up for a service can include an e-mail address and name. When signing up for a service, a user may also "opt out" of various e-mail notifications or offers (see Opt- Out Procedures below). From time-to-time our site requests information from users via surveys or competitions. Participation in these surveys or competitions is completely voluntary and the user therefore has a choice whether or not to disclose this information. Information requested may include contact information (such as name and delivery address), and demographic information (such as address, age and income level). Contact information will be used to notify the winners and award prizes. Survey information will be used for purposes of monitoring or improving the use and satisfaction of this site. Using the Email addresses provided on registration, surveys, and competitions, donegalselfcatering.ie may periodically send promotional e-mail to its subscribers about services offered by Donegal Self Catering Association. You can indicate on the subscriber registration form that you do not wish to receive further e-mail information from donegalselfcatering.ie. This site contains links to other sites. 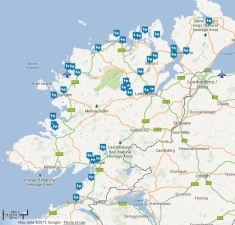 Donegal Self Catering Association is not responsible for the privacy practices or the content of such Web sites. This site has security measures in place to protect the loss, misuse, and alteration of the information under our control. Unfortunately, no data transmission over the Internet can be guaranteed to be 100% secure. As a result, while we strive to protect your personal information, donegalselfcatering.ie cannot ensure or warrant the security of any information you transmit to us or from our online products or services, and you do so at your own risk. Once we receive your transmission, we make our best effort to ensure its security on our systems. Our site provides users the opportunity to opt-in to receive promotional / marketing information. With every opportunity on our site to opt-in there is also the opportunity to opt-out should a website user choose to do so. Donegal Self Catering Association offers users the ability to change certain personal identifiable information (e-mail address,) collected during the sign up process for specific services. If you have any questions about this privacy statement, or the security practices of this site, you can contact us on info@donegalselfcatering.ie.